Chemical engineers from MIT have developed a new method to detect epigenetic modifications, which could offer a new way to choose the best treatment for individual patients. Scientists have known for decades that cancer can be caused by genetic mutations, but more recently they have discovered that chemical modifications of a gene can also contribute to cancer. These alterations, known as epigenetic modifications, control whether a gene is turned on or off. Analyzing these modifications can provide important clues to the type of tumor a patient has, and how it will respond to different drugs. For example, patients with glioblastoma, a type of brain tumor, respond well to a certain class of drugs known as alkylating agents if the DNA-repair gene MGMT is silenced by epigenetic modification. A team of MIT chemical engineers has now developed a fast, reliable method to detect this type of modification, known as methylation, which could offer a new way to choose the best treatment for individual patients. “It’s pretty difficult to analyze these modifications, which is a need that we’re working on addressing. We’re trying to make this analysis easier and cheaper, particularly in patient samples,” says Hadley Sikes, the Joseph R. Mares Assistant Professor of Chemical Engineering and the senior author of a paper describing the technique in the journal Analyst. The paper’s lead author is Brandon Heimer, an MIT graduate student in chemical engineering. After sequencing the human genome, scientists turned to the epigenome — the chemical modifications, including methylation, that alter a gene’s function without changing its DNA sequence. In some cancers, the MGMT gene is turned off when methyl groups attach to specific locations in the DNA sequence — namely, cytosine bases that are adjacent to guanine bases. When this happens, proteins bind the methylated bases and effectively silence the gene by blocking it from being copied into RNA. “This very small chemical modification triggers a sequence of events where that gene is no longer expressed,” Sikes says. Current methods for detecting cytosine methylation work well for large-scale research studies, but are hard to adapt to patient samples, Sikes says. Most techniques require a chemical step called bisulfite conversion: The DNA sample is exposed to bisulfite, which converts unmethylated cytosine to a different base. Sequencing the DNA reveals whether any methylated cytosine was present. However, this method doesn’t work well with patient samples because you need to know precisely how much methylated DNA is in a sample to calculate how long to expose it to bisulfite, Sikes says. “When you have limited amounts of samples that are less well defined, it’s a lot harder to run the reaction for the right amount of time. You want to get all of the unmethylated cytosine groups converted, but you can’t run it too long, because then your DNA gets degraded,” she says. Sikes’ new approach avoids bisulfite conversion completely. Instead, it relies on a protein called a methyl binding domain (MBD) protein, which is part of cells’ natural machinery for controlling DNA transcription. This protein recognizes methylated DNA and binds to it, helping a cell to determine if the DNA should be transcribed. The other key component of Sikes’ system is a biochip — a glass slide coated with hundreds of DNA probes that are complementary to sequences from the gene being studied. When a DNA sample is exposed to this chip, any strands that match the target sequences are trapped on the biochip. The researchers then treat the slide with the MBD protein probe. 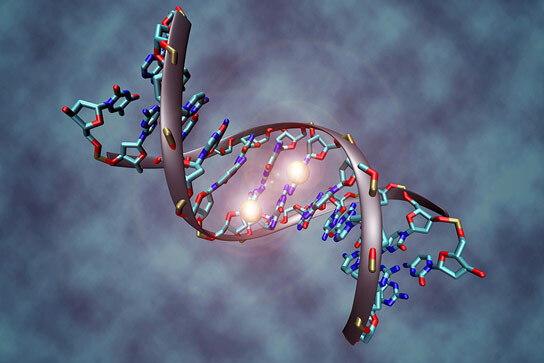 If the probe binds to a trapped DNA molecule, it means that sequence is methylated. The binding between the DNA and the MBD protein can be detected either by linking the protein to a fluorescent dye or designing it to carry a photosensitive molecule that forms hydrogels when exposed to light. This technique, which cuts the amount of time required to analyze epigenetic modifications, could be a valuable research tool as well as a diagnostic device for cancer patients, says Andrea Armani, a professor of chemical engineering and materials science at the University of Southern California, who was not part of the research team. The MIT team is now adapting the device to detect methylation of other cancer-linked genes by changing the DNA sequences of the biochip probes. They also hope to create better versions of the MBD protein and to engineer the device to require less DNA. With the current version, doctors would need to do a surgical biopsy to get enough tissue, but the researchers would like to modify it so the test could be done with just a needle biopsy. The research was funded by a David H. Koch fellowship, a National Science Foundation fellowship, a Burroughs Wellcome Fund Career Award, the National Institute for Environmental Health Sciences, and the James H. Ferry Fund for Innovation. Be the first to comment on "Engineers Develop New Method to Detect Epigenetic Modifications"